Disease diagnosis can be an expensive proposition, particular for those in poorer communities in the developing world. Think of all the medical tests you’ve had in your lifetime and how they’ve been represented in dollar figures on your insurance bill. The prices of tests can be enormous, reaching well into the thousands of dollars. While there are certainly many factors that go into the cost of medical tests, a crucial one is the complex tools, machines, and laboratories they require. In an effort to curb the costs of diagnostic tests by reducing the complexity of the tools, researchers at Stanford University have created a diagnostic instrument called a “lab-on-a-chip” that costs a single cent to produce. 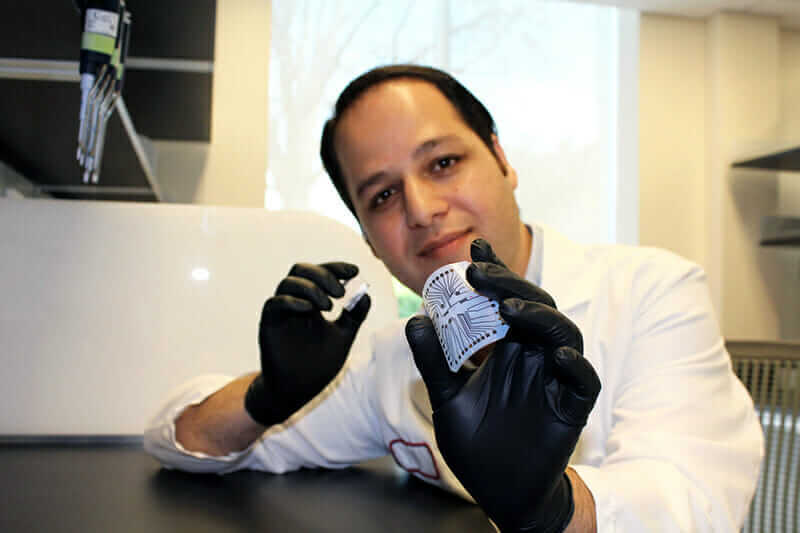 Rahim Esfandyarpour, an engineering research associate at Stanford University, displays the “lab-on-a-chip” diagnostic tool. Image courtesy Zahra Koochak/Stanford School of Medicine. 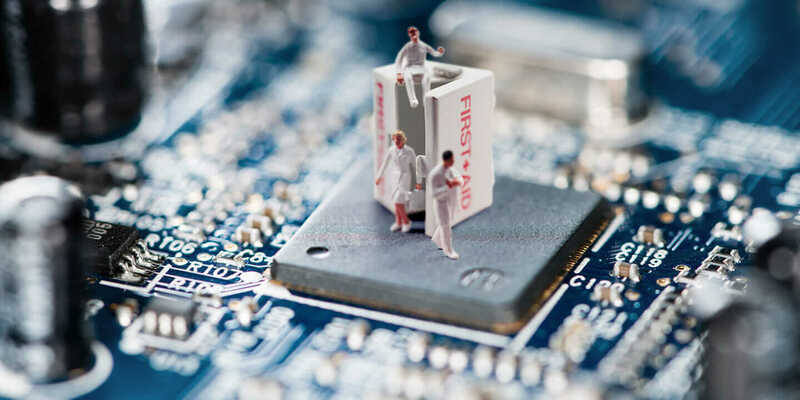 To build their chip, the researchers combined several technologies: microfluidics, electronics, and inkjet printing. 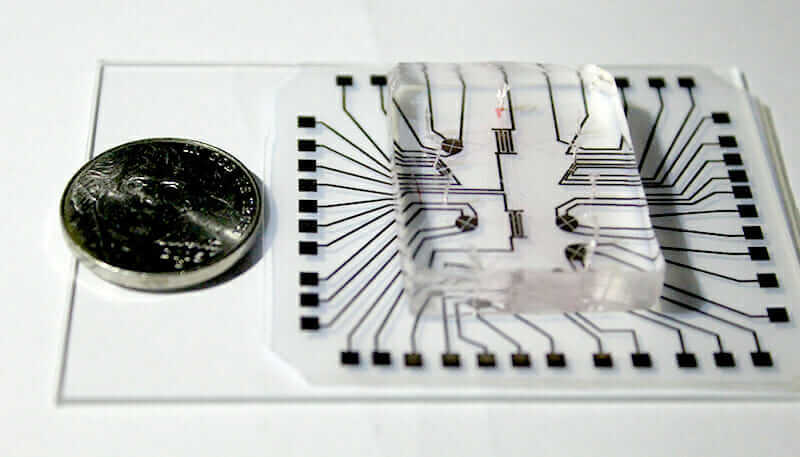 The lab-on-a-chip is a two-part system, consisting of a clear silicone microfluidic chamber for housing cells on top of a reusable electronic strip. The researchers used inkjet printing and nanoparticle ink to build the electronic strip, which winds its way through microfluidic chambers. One potential application for the chip is analyzing different cell types without having to use fluorescent or magnetic labels. Instead, the chip separates cells using a process called dielectrophoresis, which is based on their intrinsic electrical properties. When an electric potential is applied across the printed electronic strip, the cells are pulled in different directions depending on their “polarizability,” allowing doctors to differentiate them. A close-up of Stanford University’s “lab-on-a-chip” diagnostic tool (U.S. nickel for scale). Image courtesy Zahra Koochak/Stanford School of Medicine. The cost of these multifunctional biochips is orders of magnitude lower than that of the individual technologies they could replace. A standalone flow cytometer machine, for example, which is used to sort and count cells, costs $100,000, without taking any operational costs into account. If Stanford’s engineers can perfect their one-cent lab-on-a-chip, doctors working in developing countries would have access to a critical diagnostic process in regions affected by HIV, malaria, tuberculosis, and other diseases. A study describing the technology has been published in the journal Proceedings of the National Academy of Sciences. For more “on-a-chip” news, find out how engineers 3D printed the first organ-on-a-chip with integrated sensors.